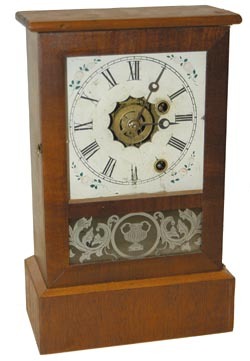 Ansonia Clock Co. mantle clock, "Farmers" or "Cottage" model, C. 1880. 11" mahogany case. This is the clock pictured in Ly-Ansonia #1702 and #1703 that was owned by my friend David Clark. Complete blue label in side the case, original dial still in very nice condition. The movement is one day time and alarm. The alarm rings on an iron bell. Everything is original, glasses, pendulum, dial, in very good condition.